My Christmas Gingerbread Waffles with Boysenberry Sauce. I have been asked for the recipe for my Christmas gingerbread waffles. I have to admit that the first time I cooked them for my Christmas guests they were really boring and so I revamped them for Christmas eve with extra cherries and nutmeg and chunks of Chinese stem ginger and they came out far better, despite the cherries turning a little black. Heres how to make them. Throw half a dozen eggs in a bowl with a little full cream milk and beat it. Throw a few tablespoons of sugar and half a teaspoon of baking powder and half a teaspoon of salt and keep mixing. Then tip a whole load of flour and beat it until it is really thick and gets a life of its own. Melt some butter – a few tablespoons will do – and pour it in. Now gradually add milk until it comes to a good thickness – dripping off the beaters in big heavy drops but not runny enough to pour from them. The mixture is much thicker than what you use for crepes. At this point, I put in lots of ginger powder, a generous sprinkle of nutmeg, chopped stem ginger (soaked in sugar syrup) and glazed cherries. Just mix it in gently or you will crush the cherries. And thats your waffle mixture. BTW – The Belgians use more eggs and sugar and less milk to make the famous waffles they sell on the streets. 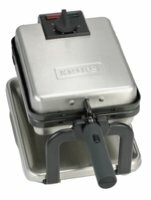 Hope you have decent waffle maker like mine – a Krups FDD912 Expert Waffle Maker with Rotary System. It was the best one i could find in Belgium. The plastic knob on the top has broken off but it still works fine. The secret on these is to turn them upside down almost immediately after putting in your mixture and let them cook this way the whole time (4 minutes should do it). I made a fantastic Boysenberry syrup and I cheated by using JAM. I melted a tablespoon of butter, threw in 2 or 3 tablespoons of Walls Boysenberry jam from Oregon, a few grindings of nutmeg and a splash of Cointreau. The boysenberry is a fabulous American invention connected with Knots Berry Farm in California. Hey – I would use real berries if i could find them. But its winter so I use jam. And if i cant find boysenberries, I use raspberries which are a little more cliché but taste good with the Cointreau. Andrew, very interesting. I made waffles this morning from a recipe in a book – it involved separating the eggs and then folding the whites back in after whisking. The waffles were great – very light, but I notice you have none of that? you are THE BEST! thanks andrew! i always throw the whole eggs in – for waffles and crepes.